You'll start in the beautiful scenery of the village of Oliena, just in the footsteps of Supramonte. From here you’ll hike to the secluded village of Tiscali and along the coast arriving at the magical cove of Cala Luna. 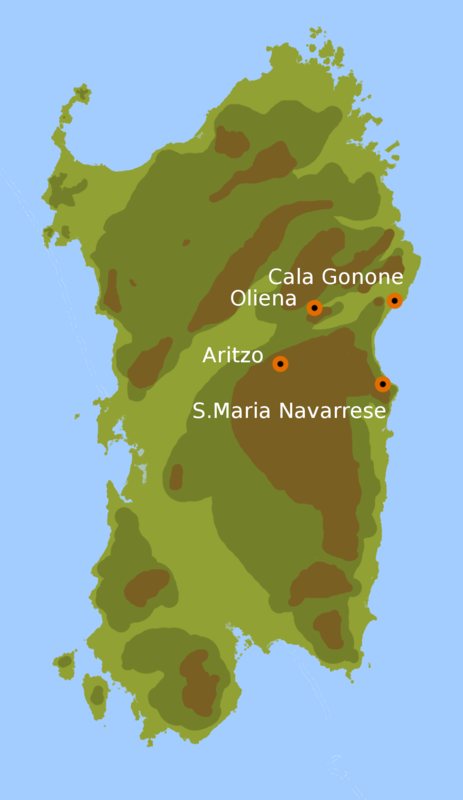 The Gennargentu range, the highest of Sardinia, is just a few km away, so we’ll drive over the mountains arriving at the heart of the island in Aritzo. Oaks, chestnuts and walnuts trees and free flocks of cows and sheep design a peaceful scenery, very diverse from the jet set along the coast. You’ll finish at the peaceful village of Santa Maria Navarrese, hiking until the imposing cliff of Perdalonga, right at the end of the Gulf of Orosei. Shuttle to hotel , brief with guide and relax. Upon arrival in Olbia or Cagliari, you'll meet us at the airport and we'll shuttle to the Agriturismo Guthiddhai in Oliena. It’s definitely one of our favourites agriturismo in Sardegna, we’ll taste their own extra virgin olive oil, their simple and tasty cannonau wine, and their locally produced food. So nice! Here we’ll have a small brief about the week, with an aperitif under the scenery of majestic punta Corrasi. Then you’ll have the rest of the afternoon to chill in the Agriturismo, or going on your first promenade to the spring of Su Gologone. At the heart of archaic Sardinia. Today’s hike takes you through the deep valley of Lanaitto to discover the enigmatic Bronze Age settlement of Tiscali, accessible only by foot. After half an hour of jeep, you’ll start walking from the bridge of Sa Barva, which will enchant you immediately the high limestone wall that runs over the river Flumineddu. The stony path begins to climb before going through the shady forest of oaks. The last climb takes us at the magnificence of the archaeological site of Tiscali, whose ruins emerge inside a limestone cave collapsed. After the excursion we’ll have a lunch with the shepherds, that will cook for us a tasty lunch using their own products in the peace of this majestic oak forest. The beauty of Orosei gulf and the Nuraghe Mannu. After visiting Northern Sardinia coastline and islands, we could think that we've seen already the most beautiful beaches of the world. It's just because you haven't seen yet the Gulf of Orosei. Then you could say you discovered, for sure, some of the most beautiful coves of the whole world. With a nice drive across the Cedrino river valley, we'll get to the village of Dorgali, and from here the views will open up over the ocean and down to the coastal village of Cala Gonone, nestled at the bottom of the limestone mountain of Supramonte. From here, we’ll drive to the area of “Buchi Arta”, to admire some of the oldes shepherds huts of the area. Here we’ll visit as well the scenic Nuraghe Mannu, overlooking the whole gulf. Then we’ll walk all the way to Cala Luna, probably the most beautiful beach of the gulf, created by the Codula Ilune creek, surrounded by hundreds of colorful Oleander trees. The ancient carnival of Sardinia and the great Cannonau. Barbagia is the home of a fierce, proud, yet hospitable people. We’ll have a cultural day visiting Orgosolo, the village of Murales, with its quite proud history to be discovered about through the murals that covers the walls of its houses, and Mamoiada, the village of Cannonau, the wine that makes us living to 100 years old. After a wine tasting and a light lunch at the Cantina Sedilesu winery, with our friends Emilio and Francesco we can visit the Museo delle Maschere (Carnival Mask Museum). On the way back we’ll travel to the hotel through Cannonau vineyards and olive groves passing pastures dotted by flocks of sheeps. Our final destination is the comfortable Hotel Sa Muvara, nestled in the mountains of Aritzo. Vast forests of Oaks, Chestnuts, Walnuts , and mushrooms picking! With our local guide we’ll explore the most popular hiking area of Aritzo, the Funtana Cungiada trail, taking us up to 1500 metres above sea level. During our hike we’ll pass under a forest of majestic trees, spending some time to find the delicious local mushrooms: Porcini, Cardoncello, Drumsticks and the most precious Ovulo. Well, it’s not a promise, but thanks to the rainy season we’ve just had we are pretty sure we’ll find plenty of mushrooms. The Gennargentu range, the “Silver door” of the island. Today we drive until Fonni, a fascinating village and the highest of Sardinia. According to the weather we can climb even to the very top of the Island until Punta Lamarmora, with almost 6000 thousand feets of elevation. On the way to the coast we’ll cross the whole Ogliastra region, one of the blue zones of the world, a place where people lives till 100 years old and more. You’ll be amazed by a very diverse landscape, made out of rugged mountains that shaped very fierce people. Even the coast is dominated by those imposing mountains, an incredible scenery. Last beautiful hike along the coast. Today we’ll have our last glorious hike to Perdalonga (the long stone), right at the southern cape of Supramonte range. It’s a perfect coastal hike, giving us the feeling of being on some tropical wild island, thanks to the luscious vegetation. The arrival point is just spectacular, and most important there’s a great family owned restaurant just under the cliff, a perfect spot to celebrate our last day (for now!) in Sardinia. Shuttle to Olbia or Cagliari airport In two/three hours shuttle we’ll take you back to the airport. As we said, we are sure you loved Sardinia... Ciao amici, alla prossima! The price of this Tour starts from 2.270 €, and it's fully customizable.